Sticky coconut rice with hearty Thai curry shrimp. Soak rice in cold water for 20 minutes and strain, leave in strainer to dry for about an hour. Cook rice in water and coconut milk, season with salt. While rice is cooking, use a mortar and pestle to crush the ginger, lemongrass, chili, garlic, shallot and Kefir leaves until a rough paste. Note: If using a premade paste instead of the fresh made, use 1oz. of paste. Skim cream off coconut milk and heat in a nonstick skillet until fat separates. Add in curry paste and sauté over medium low heat until very fragrant. Add in shrimp and sauté for 1 to 2 minutes. Add in coconut milk and Knorr® Professional Liquid Concentrated Vegetable Base. Cook until shrimp is just done. Squeeze lime juice over shrimp. 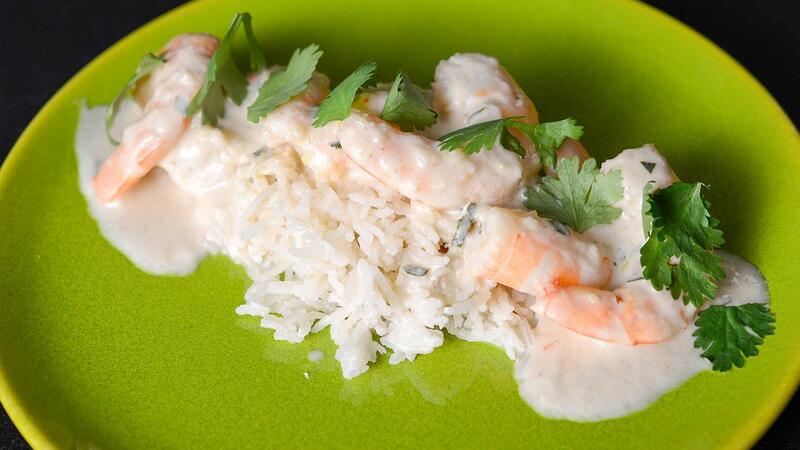 Serve shrimp curry over coconut rice, garnish with a handful of cilantro leaves and serve.